In a large bowl, combine the beef, pork, onion, crumbs, egg and crumbled bacon. Season with salt and pepper. Divide into 32 portions. In a small bowl, mix the cream cheese, cheddar and jalapeño. Form sixteen 1-inch balls. Shape 2 portions of the meat mixture loosely around 1 cheese ball. Repeat with the remaining meat and cheese mixtures. 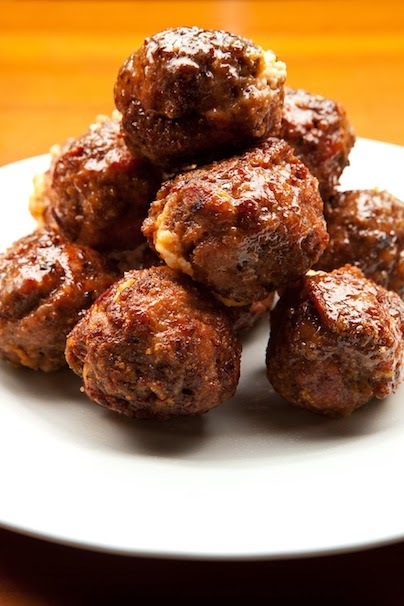 In a skillet over medium-high heat and working in batches of about four, fry the meatballs until golden all over. Keep warm in the oven until ready to serve.